This vegan lentil loaf is bursting with fall flavor from apples, carrots, celery, walnuts, and cranberry tomato glaze. It’s the perfect substitute or complement to your holiday bird. I hope you’re not full because I’ve got one more vegan Thanksgiving recipe coming at you! my Apple Quinoa Vegan Lentil Loaf. I’ve made different versions of this recipe many times over the years and even served it last year for Thanksgiving, much to the chagrin of my mother who didn’t want it stealing the show from her bird. 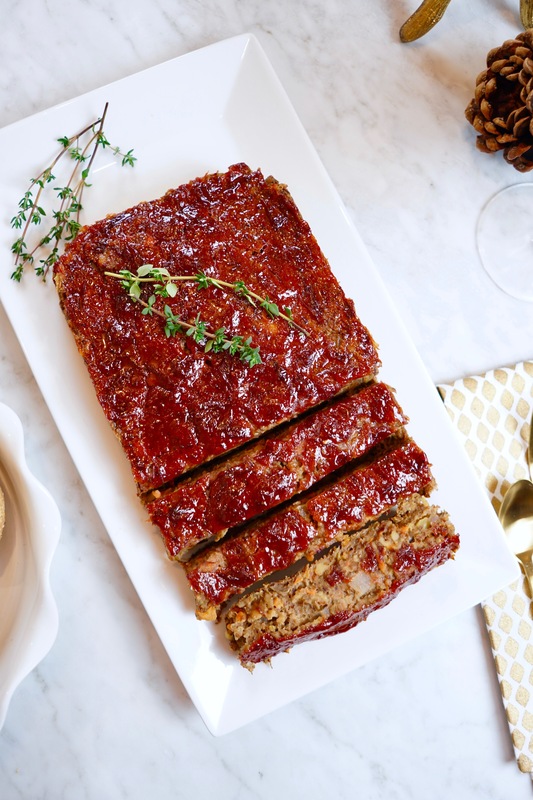 People are always surprised by how delicious and hearty this meat-free “meatloaf” tastes. As I mentioned in my last post featuring my Sweet + Savory Thanksgiving Vegetables, I am a sucker for sweetness so naturally, even this main dish has a hint of fruity flavor from the apples and cranberry tomato glaze. The subtle sweetness is balanced out with sauteed onions, carrots, celery, toasted walnuts and pungent herbs such as thyme, rosemary, and sage. By the way, if you’re unsure of how to properly cut herbs, this quick video gives a super easy tutorial. This vegan lentil loaf is full of delicious fall flavor from the sauteed apples, onions, carrots, walnuts, celery, and herbs. 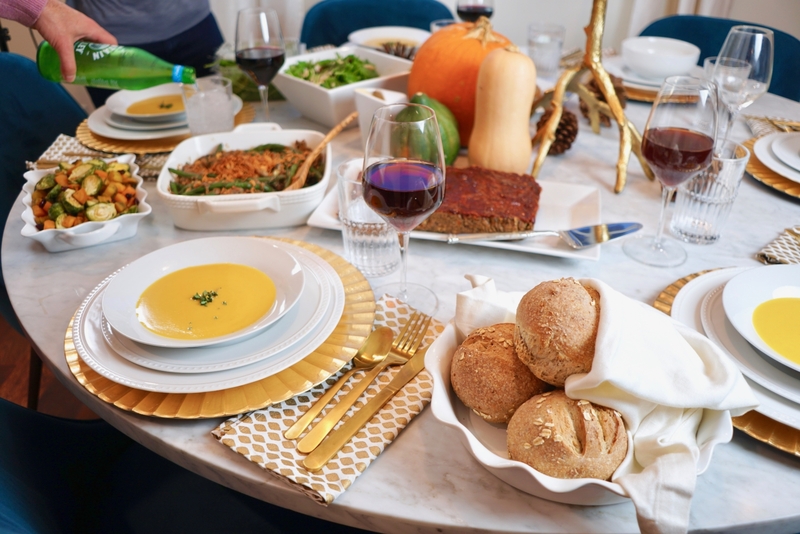 It makes the perfect plant-based holiday dinner for Thanksgiving or Christmas. In a medium pan, heat olive oil. Saute onion, walnuts, and garlic for about 5 minutes. In a food processor, pulse apple, celery sticks, and carrots until diced (or finely chop by hand). Add veggies to pan and continue to saute for 5 minutes. In a small bowl, combine flax seed and water. Let sit. Combine lentils and quinoa in food processor. Pulse until incorporated, but still chunky. In a large bowl, combine quinoa bean mixture, veggies, ½ cup oat flour, flax mixture, thyme, rosemary, sage, and salt. Add parchment paper to a loaf pan and press mixture into pan. In a small bowl, combine ketchup and cranberry sauce. Spread half over the loaf. Reserve the rest for dipping. Cook for 1 hour and 15 minutes. Let loaf sit for 10-15 minutes before serving. Despite the long list of ingredients, it’s relatively easy to make using a food processor to quickly chop the vegetables and mash the beans. If you don’t have a food processor, you can chop everything by hand. 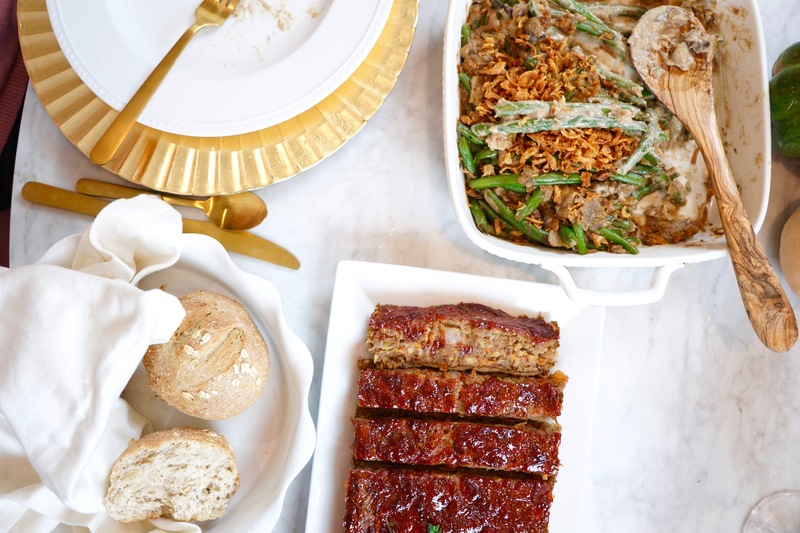 While the loaf cooks, whip up all your vegan Thanksgiving side dishes! Weigh In: What are you making for Thanksgiving? Will you try this Vegan Lentil Loaf? This looks delicious. My family wouldn’t go for ditching the bird but they may enjoy this as a dinner before Thanksgiving! Yum! This loaf looks perfect!!! Love the flavors in this and the texture looks lovely. Can’t wait to try. Yum, I love veggie loaf and this sounds so good with the apple in there. I haven’t made one in ages either, will def give this a try! 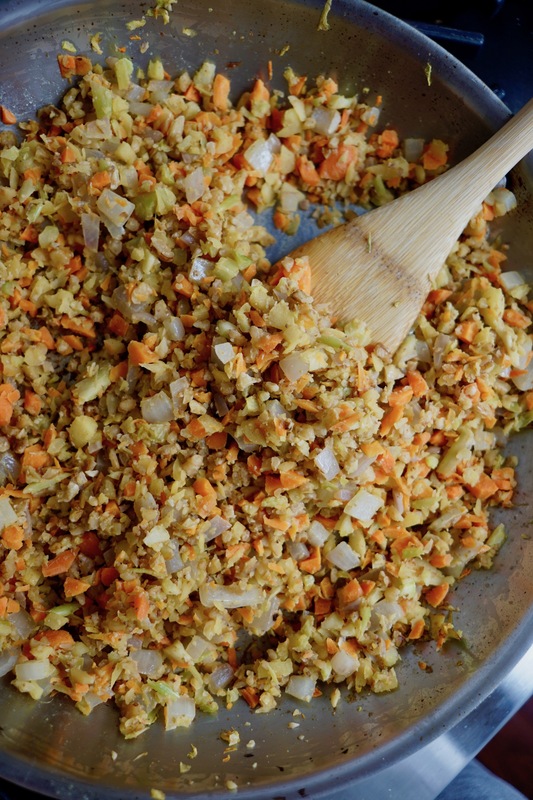 I’ve actually never made a veggie loaf, but this recipe is enticing me so much! I love all of the ingredients – it’s such a great everyday option. Love love love lentils! Definitely need to add this one to the weekly menu. Especially love the apple addition! All looks DELISH! Love the lentil recipe with apples and cranberry sauce! Well this looks super good! I love the flavors you mixed together! This looks great! I do a lentil/quinoa vegetarian meatball, love the meatloaf idea! Definitely need to try this out. This is perfect for friends and family who have dietary restrictions but should be able to enjoy the holidays just as well! Love me some lentils. Love the lentil loaf! It looks amazing. Gonna share with my clients. These flavors sound amazing! And those pictures are stunning…probably the best looking loaf I’ve ever seen. So much flavor and nutrients packed into this loaf! yum! This recipe is the bomb! My entire family loves it, my kids included, and im so happy i found it! Thank you! Although I didn’t make if for Thanksgiving (ran out of time :(…. ) I made it a few days later and am planning on making it again very soon!